A re-enactment of the last battle to be fought on British soil has been placed on the file sharing website YouTube. The film aims to provide new insights into the Battle of Culloden, as well as forming the centrepiece of a visitor centre at the site, near Inverness. 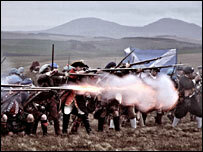 The battle, in April 1746, which was led by Bonnie Prince Charlie, marked the end of the Jacobite uprising. A preview clip of the film posted on YouTube is now set to gain an international audience. The full version will be a central part of the exhibition at the new Culloden visitor centre, run by the National Trust for Scotland, when it opens in the late autumn. Project co-ordinator Alexander Bennett said the film aimed to offer a new level of understanding of what happened at the massacre, when the vastly outnumbered Jacobite forces were defeated by government troops. "We are trying to portray the brutality of war through realistic and powerful film", he said. "It will be screened across the four walls of the theatre and we're putting the visitor right into the middle of the battle." Craig Collinson, who directed the film, first visited the battlefield as a small boy and said he relished the prospect of recreating it for film. It was made on Lauder Common, in the Scottish Borders, because the actual site of the battle is a war grave. "Attempting to dramatically reconstruct the Battle of Culloden for film - giving an impression of scale, accuracy and, above all, sense of visceral bloodiness, was always going to be a challenge," said Mr Collinson.